It's always sad when you wake, to hear one of the legends, and all-time icons has passed away. 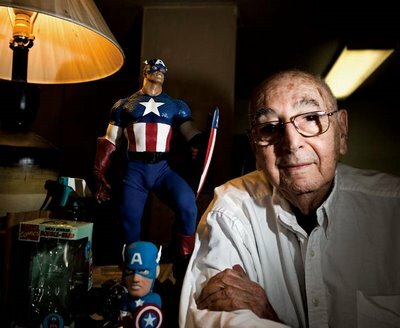 Joe Simon, as co-creator of one of my favourite characters of all time; Captain America, has died at the amazing age of 98. All thoughts and prayers go to his family at this time, in recognition of a man who helped give literally generations of people around the globe inspiration, strength and aspiration for both their careers and their own struggles in the 'real world'. Damn. Well, 98 is still a pretty good run. I hope he liked the movie - I know I sure did! I loved it too. Hell of a way to go, to see your creation on the big screen and well at that. I loved it too guys in fact I'm thinkin' a couple of people both got the movie for me for Christmas lol been the well known Cap fan I am. Oh well, can always have more then one copy of a good thing right! I agree completely Pensol - 98 is a fantastic achievement in itself - must of been on lively energetic guy! Never long enough though that time thing. Co creating Cap and the atmosphere and positive messages involved in the character I think must be on par with having done the same for Superman and Wonder Woman. To live to see that creation now a global household name, well I imagine few things can top that. I was thinking on the same lines of you guys! It was a life with time to watch his character grow and evolve in so many ways. That was nice.